“I was not supposed to be here driving this. Tayler [Malsam] was supposed to be here,” said Saldana when asked about the team’s formation and quick trip to Victory Lane. Drawing ninth in his Heat Race to start off Friday night, Saldana ran to fourth, which set the Rudeen Racing No. 26 up sixth in the night’s second Qualifier. Advancing three more spots, the overall Passing Point total put Joey starting third in the A-Feature. Racing past Seth Bergman on the opening lap for the race lead, Joey set a torrid pace as the leaders raced into traffic on Lap 7. Working top-shelf around the Cocopah Speedway, the entrance to the first turn brought Bergman back into play as the two swapped the lead for just a moment before Joey was able to race back to the top spot. “It was crazy. On an open track, or if you could get the lapped car to peel off the top, you could see and make a nice corner, but if you tried going in behind another car, or someone hit it wrong it would blow a bunch of dust up and it blended in with the wall,” commented Saldana on the challenge the corner presented. Ripping two and three wide through traffic from there on, Joey Saldana was unchallenged in the non-stop, 25 lap A-Feature; building a 2.569 second buffer over the No. 23 of Seth Bergman at the drop of the checkered flag. 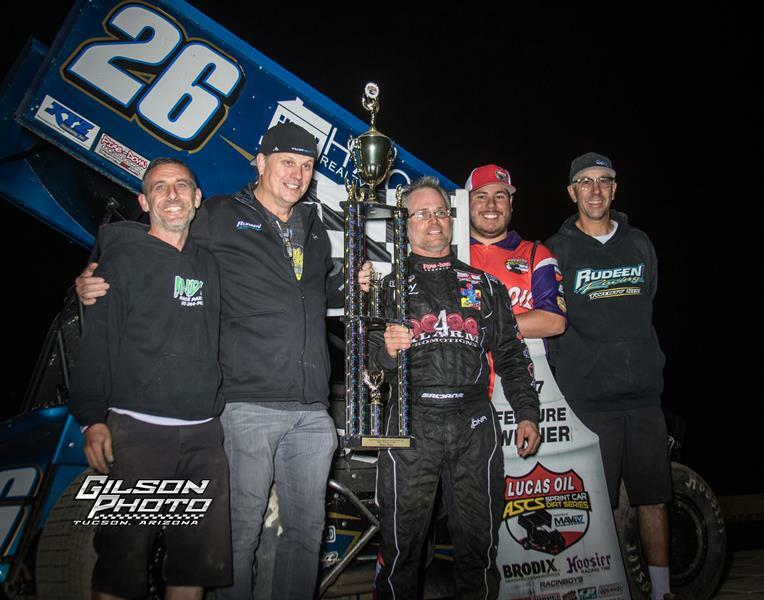 Swapping spots with Seth Bergman from Friday night, Aaron Reutzel used traffic to his advantage as the race drew to a close to grab third. Sam Hafertepe, Jr. crossed fourth with Wayne Johnson making up the top-five. Jason Solwold sixth was trailed by California’s Mitchell Faccinto with Johnny Herrera, Travis Rilat, and Lucas Wolfe making the top-ten. With event points tallied, Seth Bergman (368) has earned the pole in Saturday’s $5,000 to win A-Feature with Aaron Reutzel (359) joining him on the front row. The remaining six drivers locked in include Travis Rilat (345), Joey Saldana (341), Sam Hafertepe, Jr. (340), Wayne Johnson (326), Jason Solwold (316), and Johnny Herrera (306). With 35 drivers on hand, Heat Races went to Travis Rilat, Aaron Reutzel, Mitchell Faccinto, and Billy Chester. Qualifiers were topped by Sam Hafertepe, Jr., Johnny Herrera, and Seth Bergman. B-Main wins went to Sammy Swindell and Harli White. Racing continues on Saturday, November 11, 2017 with racing getting underway at 7:30 P.M. (MST). For continued updates on the American Sprint Car Series, from the National Tour to any of the seven regional tours that make up the over 150 races across the ASCS Nation in 2017, log onto http://www.ascsracing.com. Make sure to like the American Sprint Car Series on Facebook at http://www.facebook.com/LucasOilASCS, follow us on Twitter at http://www.twitter.com/LucasOilASCS, and check out our Instagram @LucasOilASCS. Cocopah Speedway – Somerton, Ariz.
Lucas Oil Products is the title sponsor of the American Sprint Car Series. More information can be found on Lucas Oil Products at www.lucasoil.com. MAVTV Motorsports Network is the presenting sponsor of the American Sprint Car Series. Log onto www.mavtv.com for information regarding availability and listings in your area. Associate sponsors for the Lucas Oil American Sprint Car Series presented by the MAVTV Motorsports Network include Hoosier Racing Tire, CP Carrillo Pistons, EMI, and Brodix. All Heat Races are brought to you by ButlerBuilt Professional Seating Systems. All B-Features are presented by BMRS. Team Lucas Sponsors for the American Sprint Car Series consist of Protect the Harvest, Geico, Zotto Mattress, Spray Nine, LucasOilRacing.tv, Carlyle Tools, and General Tire. Communications for the American Sprint Car Series is provided by Racing Electronics. All events are broadcast online at http://www.racinboys.com. Product and Contingency Sponsorship provided by: K&N Filters, KSE Racing Products, BMRS, SpeedMart, Engler Machine and Tool, FSR Radiator and Racing Products, Schoenfeld Headers, MyRacePass.com, Weld Wheels, Maxwell Industries, Simpson, Wesmar Racing Engines, Hinchman Indy Racewear, Rod End Supply, Smiley’s Racing Products, Speedway Motors, and Hilborn Injection.